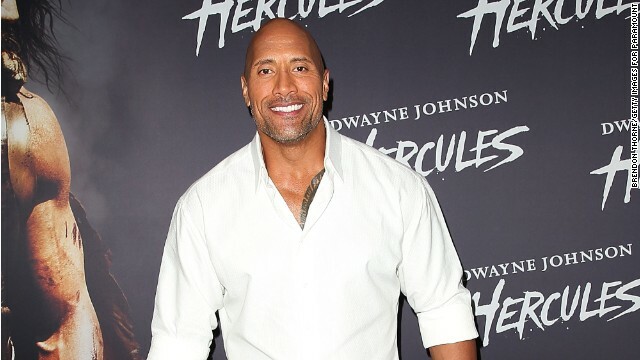 Dwayne Johnson donned a Christmas onesie for some holiday fun. (CNN) -- It wouldn't be Christmas without a celeb in a onesie. Dwayne "The Rock" Johnson joined "LIVE with Kelly and Michael" hosts Kelly Ripa and Michael Strahan for a little Christmas karaoke smack down on their show. The trio donned Christmas onesies and Johnson offered his version of "Here Comes Santa Claus." The star posted a picture of his performance on Instagram with the caption "Here comes Santa Claus, here comes Santa Claus right down Santa Claus lane..." #KaraokeKING #LIVEWithKellyAndMichael #ChristmasEveShow #RealGsWearOnesies." He wasn't the only one enjoying the festivities. Taylor Swift had earlier posted a selfie with her adorned tree and later tweeted "My dad just gave me ten lint rollers for Christmas, not for lint but 'because you always have glitter all over you'. Great start, Swifts." Uh oh Look what I did. My dad just gave me ten lint rollers for Christmas, not for lint but 'because you always have glitter all over you'. Great start, Swifts. Based on Beyonce's Instagrams she's enjoying a white Christmas with husband Jay Z, a helicopter and plenty of snow - all the better to chill the bottles of bubbly she snapped photos of buried in the white stuff. Twitter let us know that Jennifer Lawrence spent some time giving back by visiting Kosair Children's Hospital in Louisville, Kentucky. Victoria's Secret model Alessandra Ambrosio posted a picture of a smooch with fiance Jamie Mazur next to their tree with the caption "All I want for Christmas #itsthattimeoftheyear #christmas #holiday." Kim Kardashian reminisced about past holidays by posting a picture of her and sisters Khloe and Kourtney when they were little girls, wearing their festive pajamas and nightgowns. Her caption read simply: "Merry Christmas!"